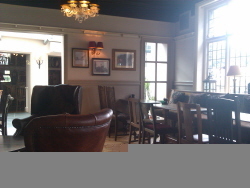 As mentioned in their publicity, the Coach and Horses has been substantally revamped, with the whole pub bigger and brighter. The back has been knocked through to create a restaurant and there are several different areas to the pub all of which are fitted with a glorious mix of tables and chairs as is the outside, offering a great choice of where to sit as the first decision to be taken. The light now comes streaming in through all the windows although the restaurant was a bit dark, hence our decision to sit in the main room (approximately where the singer would stand in the days of live music). I had a very perfect pint of Young's bitter for £3.50 with a selection of Young's beers and guest ales on offer. The wine selection was wide, with a range of attractive wines for under £20 as well as the more expensive selection. I went slightly off menu and had a bar snack for my starter: a half pint of prawns in shells with garlic mayonnaise. It was a very generous pot of fresh prawns that still tasted of prawns, a rare occurrence nowadays. The garlic mayonnaise had more than a hint of Marie Rose sauce being light pink which was a shame but it was a nice smooth creamy sauce. 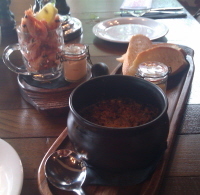 My companion had the Wild Mushroom and Garlic Crumble, beautifully presented in an individual pot. This consisted of Portobello and other mushrooms in a very delicate cream sauce topped with crunchy toasted breadcrumbs that gave a pleasing contrast. This was an excellent dish that needed savouring and eating slowly. 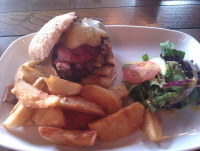 For main course I had the Coach and Horses Beef Burger, Lincolnshire Poacher Cheddar, Smoked Bacon and Hand Cut Chips. The burger was a bit dry, with an added hint of something (cumin or similar) that displeased me. The cheddar and bacon were both good strong tastes that melded well. The chips were incredibly fluffy on the inside and beautifully crunchy on the outside and nicely seasoned. 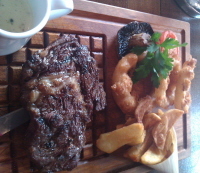 A 21 Day Matured Ribeye was my companion's choice served with chips, mushrooms, tomato and onion rings. The beef was good quality beef and tasted so.The tomato was slightly caramelised and grilled; along with the mushroom they were both very juicy and tasty and worthy of mention. The onion rings were the lightest either of us had ever had with a crispy batter that crunched into nothing when you bit on it. She had a peppercorn sauce to accompany it which was very mild if you didn't bite the peppercorns and a lot stronger if you did. It was presented separately so you could mix at will. I liked the sauce and I don't like peppercorn sauce. 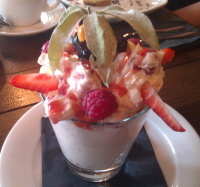 For pudding, which we really didn't need I had a Raspberry, Blueberry, Strawberry Syon Mess which looked absolutely beautiful. There was too much cream to smother the too few fruits which were very fresh and the meringue was too hard on the outside and not chewy enough in the middle making the large piece of meringue very difficult to break into. The Chocolate and Bailey's Cheesecake was a smooth, not too sweet light cheesecake with enough of a hint of Bailey's to add without it being overwhelming. We finished off with a fantastic cup of coffee, so good that I had another one. Barsnacks were also available at £4 each or £10 for 3 with sausages, ribs, scampis, piri piri chips and onion rings. The bar staff were charming and talkative although occasionally slow. The atmosphere is very relaxing and gentle.The three course meal for two came to a very reasonable £63 although that only included one pint and soft drinks. Some of the menu items need tweaking slightly to make this quite the repast that the Coach and Horses is trying to achieve. But it's early days and hopefully minor changes will be made to turn it into a great meal for the price rather than a mostly great meal. I'll go back in a few months and check (it's a hard life...).